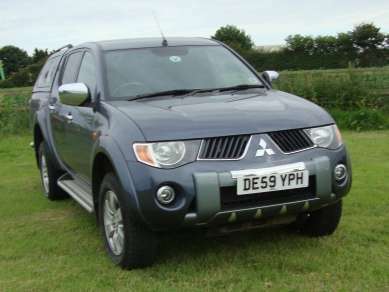 OCTOBER 2009 59 PLATE MITSUBISHI L200 2.5 DI-D WARRIOR MANUAL 4X4 DOUBLECAB PICKUP, GREY, 56,150 MILES, REMOTE CENTRAL LOCKING, AIR CON, E/W, E/M, RADIO/CD, CRUISE CONTROL, FRONT FOGS, RUNNING BOARDS, ALLOY WHEELS with 245/65R17, TOWBAR WITH SINGLE ELECTRICS, COLOUR CODED ALPHA GSE CANOPY WITH WINDOWS & ROOF RAIL, LOAD LINER. SERVICE HISTORY. MOT SEPTEMBER 2017.